Current airplane headrest designs do little more than leave you with an irreversible case of bed head (minus the actual sleeping part of the process). A Dutch industrial designer named Manon Kühne has graced us all with a headrest we can only hope will become a regular airplane feature. In fact, we haven't been this excited since someone fixed the middle seat by staggering the seat set-up. The fact that this headrest design looks comfortable isn't even the best part--thanks to a set of wing-like arms on either side, you can slumber somewhat privately. Aptly named "HeadRest," the design recently came out on top of the University category of the 2016 Crystal Cabin Awards--an annual program celebrating innovations in airplane features. The design was Kühne's thesis project, created with help from the Human Factor's and Ergonomics Lab at Zodiac Aerospace. Compared to the plastic- or napkin-covered headrests we're used to, this is every frequent flyer's dream. The HeadRest's arms open up a stretchy, hammock-like net to softly catch your jet-lagged head. 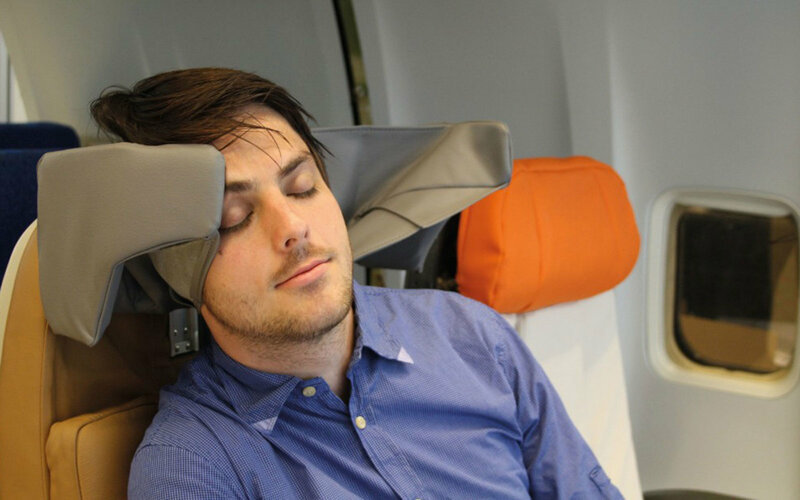 Combine that with the inability for your seatmate to actually see your slack-mouthed sleeping face, and, well, this might be the perfect way to make economy worth flying again.